We are no longer updating this story. Our latest updates on the Thomas Fire can be found here. Last updated at 11:34 a.m. with state of emergency and latest evacuation orders. 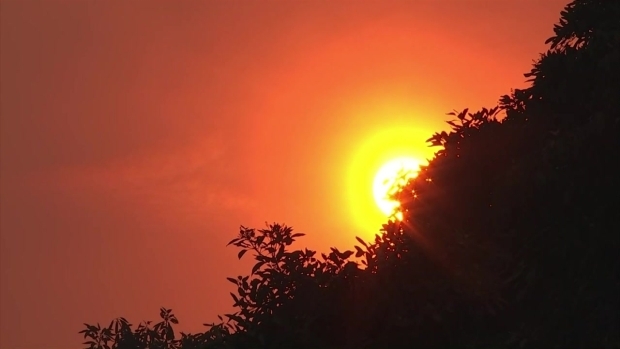 Firefighters on the ground and in the air are battling a fast-moving brush fire raging across 45,000 acres in Ventura County, destroying 150 structures and forcing 27,000 people to flee their homes, fire officials said Tuesday morning. Gov. 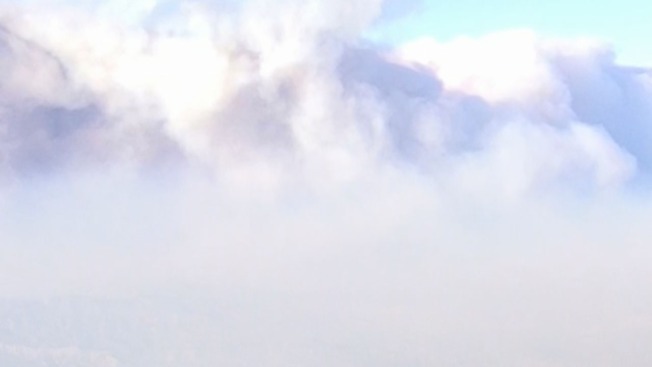 Jerry Brown declared a state of emergency in Ventura County because of the fire. Officials had earlier said a person's death was associated with the fire, but Ventura County spokesman Bill Nash said early Tuesday that death was a family pet, not a person. One firefighter was injured, but details on his condition weren't immediately available. The fire, dubbed the Thomas fire, was first burning just south of Thomas Aquinas College. The college issued a fire alert Monday around 8 p.m. and evacuated all students to nearby homes as a precaution. More than 8,000 homes were evacuated and 20,000 people remained without power Tuesday. That figure was down from 200,000 customers who were in the dark Monday night because of transmission line problems associated with the fire. Due to the intensity of the blaze, fire crews were reportedly having difficulties accessing the burned areas. Multiple agencies are responding to the fire. The Los Angeles County Fire Department was also assisting in the firefight. Nearly 8,000 homes were ordered to evacuate Tuesday from Santa Paula to Ventura. Residents in Santa Paula, east of Dickenson Road, north of Monte Vista Drive along Highway 150 and South of Thomas Aquinas College to the area of Say Road. Residents in Upper Ojai, north of Highway 150 from Koenigstein Road west to the Dennison Grade, north to Reeves Road, east to McAndrew Road and north to Grand Avenue. Ventura, Vista Del Mar Hospital has been evacuated and patients will be transported to LA area facilities by ambulance. There are two evacuation shelters available to residents who were displaced. The first shelter was at the Ventura County Fairgrounds at Miners Building located at 10 West Harbor Blvd. in Ventura. All types of animals are also welcome at this shelter. The second shelter was at Nordhoff High School at 1401 Maricopa Highway in Ojai. A third shelter was set up at the Oxnard College Gymnasium, located at 4000 S Rose Ave. in Oxnard. The California Highway Patrol closed Highway 150 in both directions -- at Sisar Road, at Stonegate Road, and at Santa Barbara Street -- as firefighters battled the blaze. Soft road closures were issued for Wheeler Canyon Road at Foothill Road, Highway 150 at Reeves Road and Highway 150 at Santa Barbara Street. Santa Paula School District, Oxnard School District, Port Hueneme School District, Ventura Unified School District, Mesa Union School District, and Ojai Unified School districts were all closed Tuesday due to the fire. About 20,000 customers remain without power Tuesday morning.